Want More Money from Adsense? Here is part two of the article submission list. Remember, article submission = money! In continuing with the spirit of the amazing profit potential of article writing, I will provide lists of article submission websites. Submitting articles = backlink creation = traffic! Traffic = Money, therefore, article submission = money! See how nicely that works out?! Keep in mind that moe websites pop up everyday, therefore, this list is not exhaustive. Associated Content is a great website. In addition to building backlinks to your website, Associated Content bids on your article in the beginning. Therefore, you do not have to wait for people to click on advertisements. 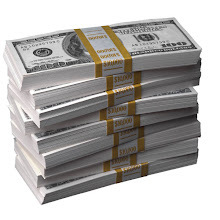 Associated Content pays you in the beginning and gives you bonuses for every 1,000 page views. Check out Associated Content today! Another great site is Triond. Here is how it works: You submit your content toTriond and then Triond publishes your content wherever they feel it will do best. You get ad revenue and split it 50-50 with Triond. The only problem I have with Triond is that any content you submit cannot exist anywhere else on the web. Anyway, here are two great revenue creating websites. Check them out! Fellow internet fortune seekers, I have found a truly AWESOME website. You may have heard of this concept before, and then again, maybe not. If you have a Google Adsense account, and a blog or internet site, then you MUST check out this site to increase your Adsense earnings. Sign-up is easy, quick, and FREE! Add content and make money. It is that simple. Want to know more? Click Here to Increase Your Adsense Earnings! Sign-up is completely free, it is crazy addicting, and tons of fun! Best of all, myLot allows you to “claim your blog.” Therefore, you can market your blog to all the people on myLot. Also, you MAKE MONEY for doing the things you do everyday on Google and Myspace. Posting comments, posting pictures, participating in discussions, etc., all EARN YOU MONEY! Another great aspect about myLot is that only 92,000 members exist! Can you imagine if this site grew to the size of Myspace?! Myspace has about 180 million! Can you know see the earning potential? Check it out today and you will see why myLot is the next BIG thing!